‘Chinese New Year’ that is. The Year of the Rabbit. Perhaps an excuse to go to one of the islands where wild rabbits can be found like Soneva Fushi, Hudhuranfusi and Komandoo. 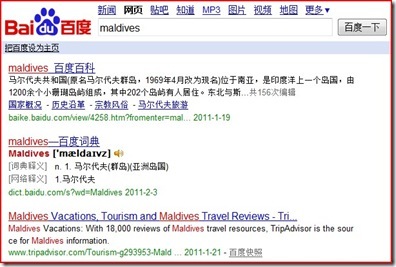 While this might be the Year of the Rabbit, 2010 was definitely the ‘Year of the Chinese’ in the Maldives. The 114,158 Chinese visitors was an increase of 96.1% which was the biggest contributor to the Maldives’ big 20.7% increase overall for what was still an economically challenged year. And there are no signs of the trend letting up. These numbers put China #3 in the list of most visitors behind the UK and the USA. But, in January the Maldives had their first day ever where the number of Chinese surpassed UK visitors. Furthermore, Minivan recently announced that Mega Global Maldives is launching its first direct service from Hong Kong. But the biggest driver to this influx is the growing pile of Chinese money. Long gone are the days when my parents told me to think of all the ‘starving children in China’ to get me to finish all my food. Now China is an economic powerhouse with a blossoming financial elite. For a striking perspective on the dizzying momentum of economic China’s growth, check out ‘Shanghi 1990 versus 2010’. The Sunday Times wrote a piece, “Great Mall of China” on the explosion of luxury consumption among Chinese. Also, the Daily Mail ran a piece titled ‘Duck and Caviar’ in their print edition. They make the interesting observation that years of Communist ideology meant that “the idea of having lots of money and splurging it around is considered distasteful.” They refer to the ‘Peking Pound’ as ‘stealth wealth’ where Chinese prefer more understated activities like bird watching and calligraphy, to splashing around in yachts and sports cars. One can see how the simple charms of Maldivian paradise could fit their bill very nicely. The trend has significant implications for the tourism business on the islands. Obviously, the language issue will need translations of materials as well as the hiring of Chinese speaking staff. A number of resorts already cater strongly to groups of non-English speaking guests: Germans at Reethi Beach, French at Rihiveli, Italians at many such as Alimatha and Dhiggiri. I’d be curious to see if an entrepreneur opens a resort focusing on the Chinese in a similar way. Another less obvious implication is impact on water management. Corresponding to the rise of Chinese visitors has been the rise of Chinese fatalities. Specifically, deaths by drowning while swimming or snorkelling. This is not a statistical aberration because no other groups have suffered hardly any fatalities. As a result, it does appear to be a cultural issue…the Chinese are not good swimmers. A number of dive instructors supported this observation to me on my last visit. If more and more Chinese are going to visit with less and less swimming skills, then the Maldives will need to re-evaluate how to monitor and protect swimming guests (eg. restrictions, competency tests, lifeguards).